Optimism surrounding global equity markets near late-Friday seems well received by traders so far. In addition to trade and credit data from China, positive start to the US earnings season led by JP Morgan and Wells Fargo kept the risk-on mood intact on Friday. Consequently, Gold prices dropped to the lowest point since April as they trade below the 1290 level in today's early session. The 10-year treasury yields on the US government bonds remained little changed around 2.56%, also near four-week high. Despite recent risk-on sentiment, the International Monetary Fund continues to highlight downside risks to the global economy. As expected, Gold prices continued to head downwards breaking below the $1290 level. The momentum has dropped drastically as the price is currently trading just above the $1287 level. 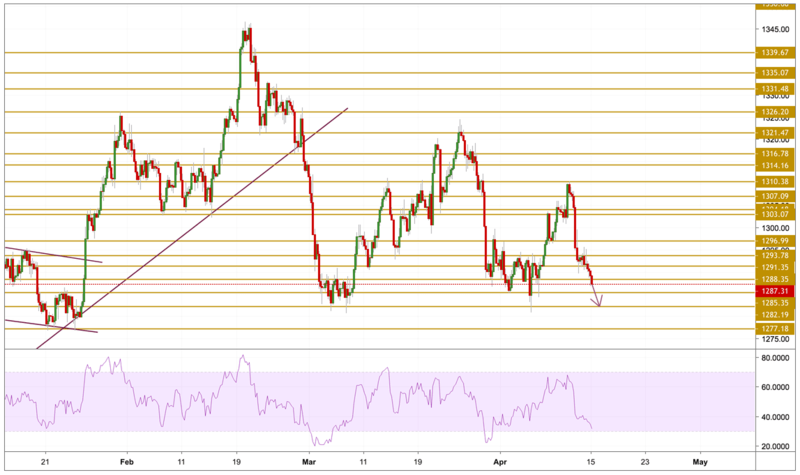 The yellow metal has still more room to go before entering the oversold zone, that is why we will be focusing on the $1282.19 support level.